Corn is a good source of good carbs but corn syrup which is also made of corn can be unhealthy because of its high starch content. Corn syrup is a type of food which is highly processed and can tend to increase your weight by increasing your sugar craving and contains a lot of calories. Aerated beverages like sodas, sports drink, energy beverages and flavoured waters are loaded with empty carbohydrates. These sugar sweetened sports drinks contain 24 to 29 grams of carbohydrates per serving. A single can of soda has 36 grams of carbohydrates. The carbs you obtain from these beverages have no nutrition or fiber at all, one should try to avoid such beverages as much as possible. Refined granulated sugar is the main ingredient in Candies and is a source of carbohydrates which have zero nutritional value and needed to be avoided as much as possible. Gummy candies contain the highest level of starch and should be avoided as well. The most pure refined form of carbohydrate is present in Fructose and granulated sugar which is 99.999% carbs with no nutrients at all. You must avoid eating plain refined sugars as they contain pure form of empty calories. Products made from refined flours like cakes, cookies and breads are very rich in carbs. A single slice of cake alone contains about 35 to 70 grams of carbohydrates. Cookies made from refined flour contains 84% carbohydrates. Low fat crackers, chips and rice cakes which are sold in the name of diet foods contain a high level of carbohydrates to make these items tasty. Such low calorie products and snacks contain 80% carbohydrates. We all Love Jams, but did we know that these sweet spreads contain 65% carbs which are mostly empty carbs and have no nutritional value. Dry jams contain more carbohydrates than normal jams. Sauces and pickles are those sweet relishes which have 35% of carbs and are loaded with a lot of oil. We must try to avoid such sauces and pickles as much as possible. The blood sugar levels of the body gets disturbed due to the excessive intake of carbohydrates. Having excessive carbs in your diet is also linked to obesity, heart diseases and diabetes. Having excessive carbohydrates can lead to frequent irritation and mood swings too. Refined carbohydrates, complex carbohydrates, low fiber and simple sugar are said to be dangerous to the body if taken in excess. 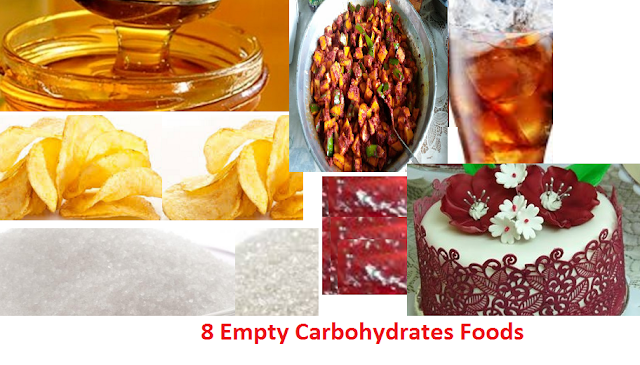 Also having lesser carbs is also unhealthy as it can lead to nausea, muscle pain, wellness and resistance to disease.